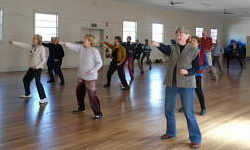 Gentle Chinese exercise including such qigong forms as Shibashi, Lotus and 8 Pieces of Brocade. Excellent for flexibility, strength, balance and bringing harmony and peace to the mind, body and spirit. Newcomers very welcome. This class is suitable from beginners to experienced practitioners.